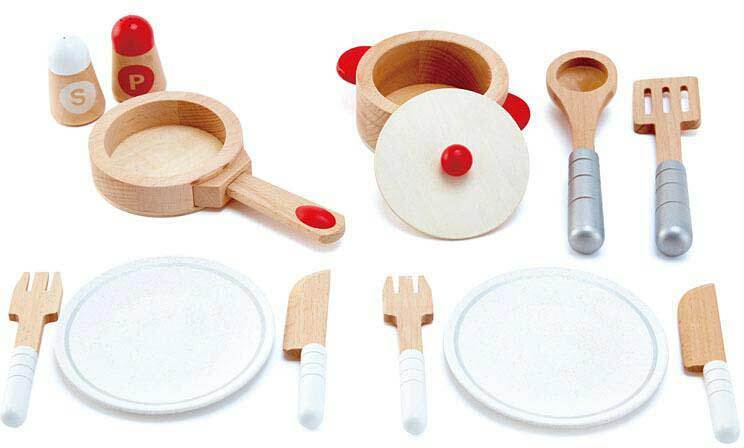 Including everything your child needs to cook and serve a delicious meal for two, the Cook & Serve Set comes complete with pot, pan, lid, spoon, spatula, two plates, two sets of knife and fork, and a pair of salt & pepper shakers. Made from high-quality wood for a stylish, modern look. 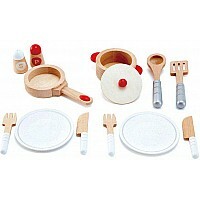 Realistic elements like the shakeable salt and pepper set will fire your child's imagination and inspire play. The set's wooden pot comes complete with removable wooden lid. Suitable for children aged three years and up. Measures approximately: 7.87 x 3.94 x 10.24 inches..